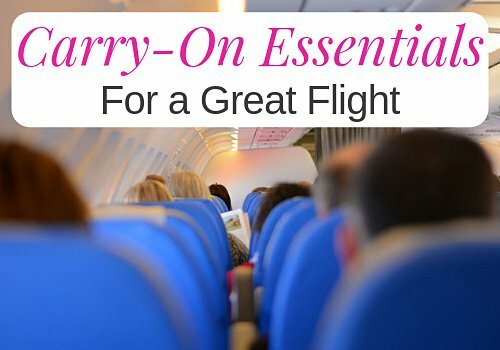 So you’re jetting off to Los Cabos in Mexico for a beach holiday. Lucky you! There are so many things to do in Los Cabos if you like the water. Maybe you want to learn to surf? Or go on a (non-cheesy) Cabo dinner cruise around Land’s End? And you’ll love walking, swimming and chillin’ on the Los Cabos beaches – we do! This desert-meets-the-sea resort destination is ideal for beach lovers and water sports enthusiasts. Cabo sunset cruises – Classy yachts, party boats, dinner cruises, etc. Surfing in Cabo San Lucas – Best surf spots in Cabo San Lucas, surf shops, surf reports, tours and lessons, etc. 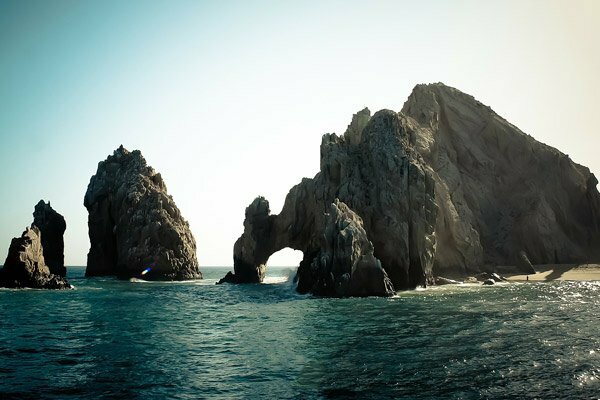 In Cabo, you can’t help but notice the magnificent natural rock formations jutting out into the sea. That’s Land’s End, at the southernmost tip of the Baja Peninsula. 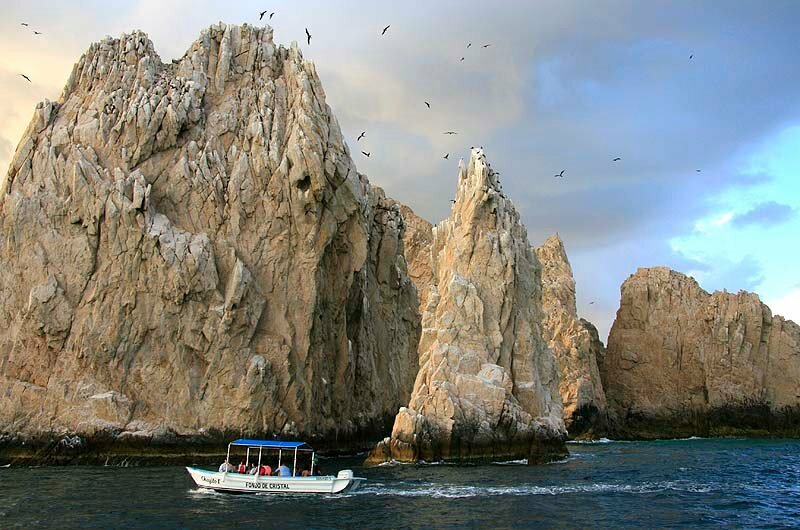 And one of the best ways to see Cabo’s signature landmark is by taking a water taxi. These small wooden boats (some with glass-bottoms) shuttle back and forth between the marina, Lover’s Beach (and Land’s End) and Medano Beach. Can you walk under the Arch? We took the photo of the famous rock Arch at Land’s End (shown at the beginning of this post) a few years ago when shifting sands created a beach and you could walk through the Arch. There’s no beach there today, but you never know, with changing sea and weather conditions, a beach could form there again in future! As you pass Lover’s Beach, you get gob-smacking views of the Arch (“El Arco”) – the famous 200-foot rock arch that looks like a donkey drinking from the ocean. 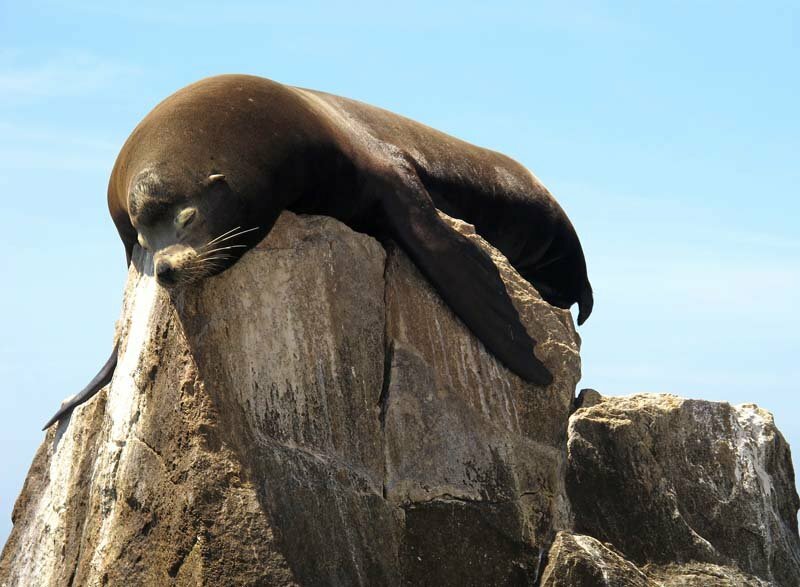 Steller sea lions bask in the sun on a cluster of large nearby rocks and play in the surge. You can smell their strong ammonia stench and hear them barking too. And you’re sure to see pelicans hovering about the lime-splattered Pelican Rock. Typically, the boats take you on a 30- to 45-minute, mini-sightseeing cruise around Land’s End to Divorce Beach, then drop you off at Lover’s Beach. You agree on a pre-arranged time for the boat to pick you up from the beach and take you back to the marina (or Medano Beach). The price is good – between $10 and $12 per person. There are no docks at Lover’s Beach or Medano Beach, so it can be tricky getting out of (or in) the boat. As the boat rides in on the crest of a wave, you have to jump off the boat into the water and wade ashore. A local is usually on hand to help you in exchange for a small tip. But you likely will get wet! There’s lots of fun to be had gazing at what’s under the water. Land’s End is nice and close. Santa Maria Beach and Chileno Beach also offer good snorkeling. Snorkeling tours by boat typically combine snorkeling at two or more sites. 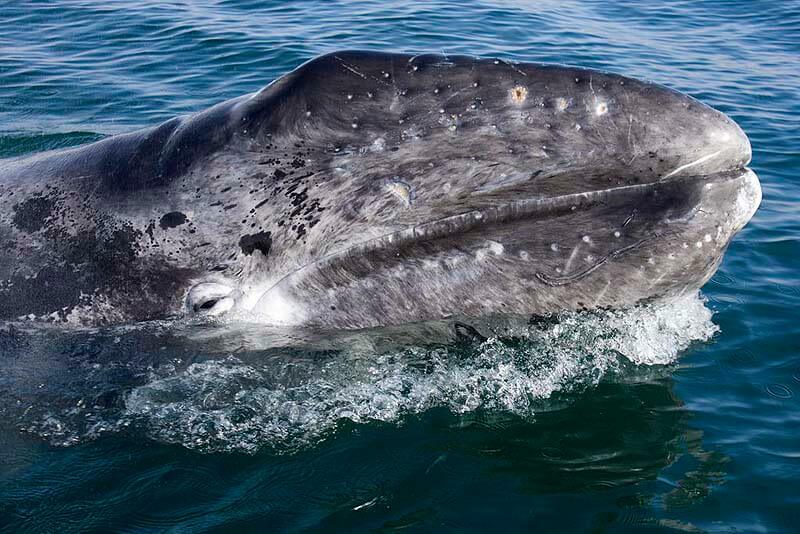 Whale watching is hugly popular between December and April, when gray and humpback whales migrate to the warm waters off Cabo San Lucas and San Jose del Cabo. See them up close on a whale watching tour. For adrenalin thrills, go on a high-speed Zodiac. Or if you want something more stable, choose a tour aboard a big catamaran. There’s no better way to take in Cabo’s stunning sunsets than out on the water on a sunset cruise. You might have seen Land’s End by day, but it’s a whole other experience when the sun starts to drop below the horizon. The golden light shimmers on the water and a fiery glow outlines the stark rocky cliffs. Then when the night turns dusky black, the twinkling lights of Cabo are so romantic, you can’t help but hug the person beside you. Most cruises are between two and three hours long and offer drinks and appies. Some offer dinner too. We’ve been on the Rissalena a couple of times; Laura (the owner/manager) does an excellent job taking guests on dinner cruises on a custom-designed power catamaran. Dinner is surprisingly very good (considering you’re on a boat) – home-made finger lickin’ barbecued ribs or chicken, healthy fresh salad, guacamole, fresh fruit, etc. This is a premium experience and one that consistently gets top reviews year after year, for good reason. See the sun set from your own private sailboat (well, your own sailboat for a couple of hours at least). Cabo Sails offers private charters for two to 20 guests on a selection of sailboats ranging in length from 28 to 44 feet. 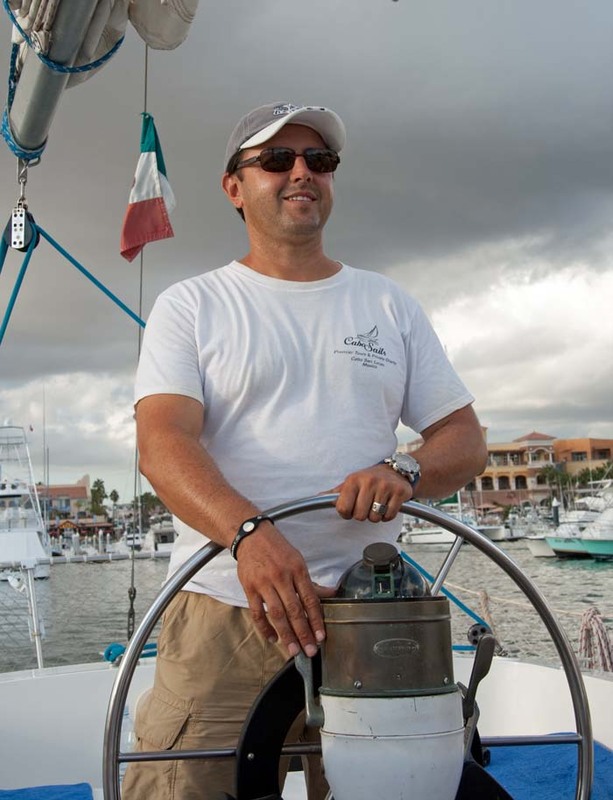 On the 44-foot Espiritu Santi, we lolled about like Romans on plump big cushions scattered on the deck of the bow, as we sipped wine and nibbled on fresh veggies and chicken taquitos. If you’re looking for a party cruise, pick Pez Gato (some of the cruise lines book their shore excursions with Pez Gato). It’s fun, reputable and you can’t beat the price. The tour operator has a few different boats, but their “Cabo Booze Cruise” is the one for dancing, drinking, games and high spirits. Slip on your dancing shoes (blue suede?) for this sunset dinner-and-dancing cruise. 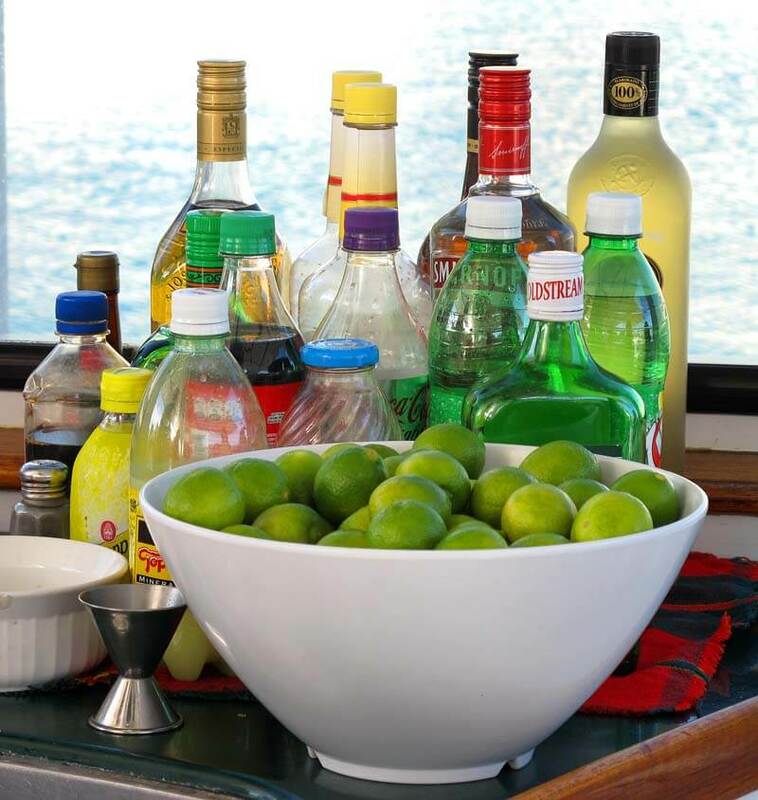 It’s not a booze cruise, but a fun 2 ½ hour Cabo dinner cruise suitable for couples and families. You’re not likely to get seasick on the Cabo Mar – it’s a double-decker catamaran, 65 feet long and 36 feet wide. You can dive at Land’s End. But for knock-your-socks-off diving, head to the national marine park of Cabo Pulmo – where the wild things really are (like sharks). October is an awesome month to go diving in Los Cabos. Read more about scuba diving in Cabo – it’s an underwater world of wonders! Get amped on big barrels and pumping wave action! Los Cabos and beyond boasts some rocking surfing beaches. On the Sea of Cortez side, the waves are largest in spring and summer (March to October). Check out Playa Acapulquito and Playa Costa Azul. For winter waves, head to Los Cerritos and Pacific-side beaches near Todos Santos. Find free daily Baja Sur surf reports on Surforecast.com. Costa Azul Surf Shop – Excellent rental equipment and instructors; they also take small groups on surfing excursions. 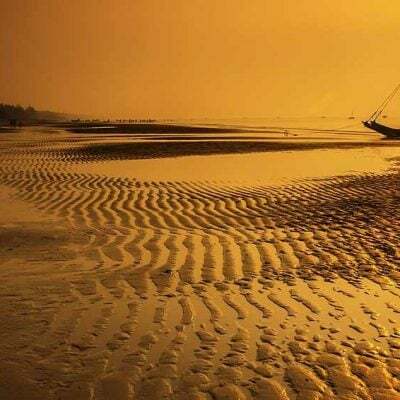 High Tide Sea Expeditions – One of the best tour operators, with friendly professional guides who go the extra mile to get you standing up on your surf board. Mike Doyle’s Surf School – A good place to learn to surf; all instructors are certified by the National Surf Schools & Instructors Association (NSSIA). Cabo Surfer – A new surfing outfitter based in San Jose del Cabo. See the Surfers Guide to Cabo 2018 on WaveTribe. We know, we get it! 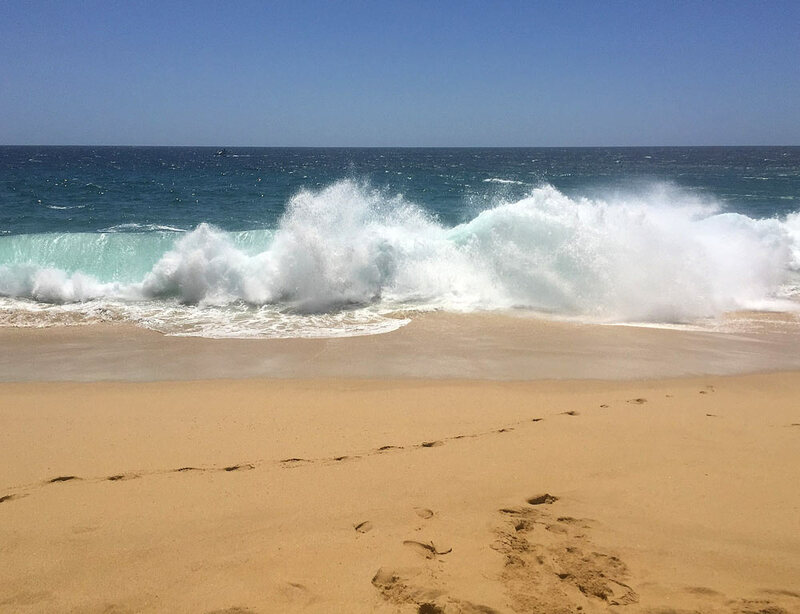 The beach is where you want to spend a lot of your time when visiting Cabo. And there are many gorgeous beaches in Cabo! Just remember you can’t swim at some. In fact, rogue waves and rip currents make these particular beaches downright dangerous. So be sensible choosing where to swim. 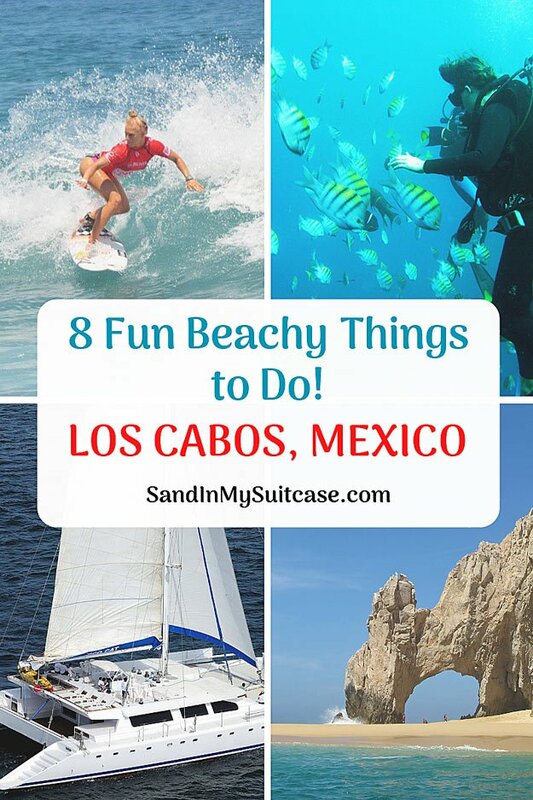 Find out all you want to know about the 5 best beaches in Cabo San Lucas here! 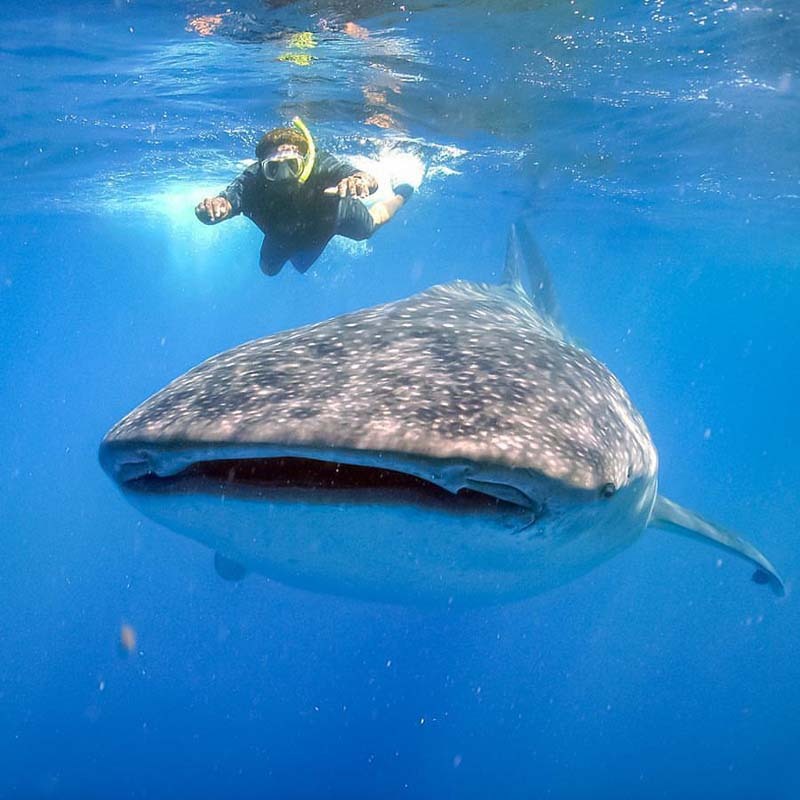 There are few places in the world where you can swim with endangered whale sharks – La Paz is one of them. La Paz (which means “peace” in Spanish) is an authentic Mexican town on the east coast of the Baja Peninsula. The drive from Cabo San Lucas takes a little over two hours. Basically, you go out by boat into the Bay of La Paz. When whale sharks are spotted, you slip into the water wearing snorkeling gear, and watch as the huge gentle fish swim by you. It’s an unforgettable, once-in-a-lifetime experience – and highly recommended if you visit Los Cabos between October and February. The weather is typically very reliable from October to May (sunny and hot), making fall to spring the best time to visit Cabo San Lucas. That works out very nicely for North Americans and Europeans – you can go somewhere warm when it’s cold where you live! The best restaurants? Can you drink the water? 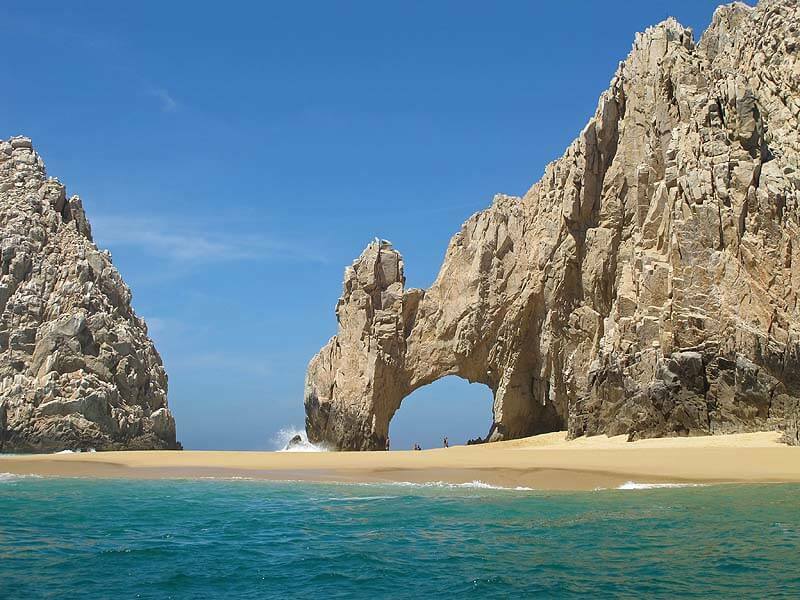 Get more Cabo tips here in our complete Los Cabos holiday guide! Whew! 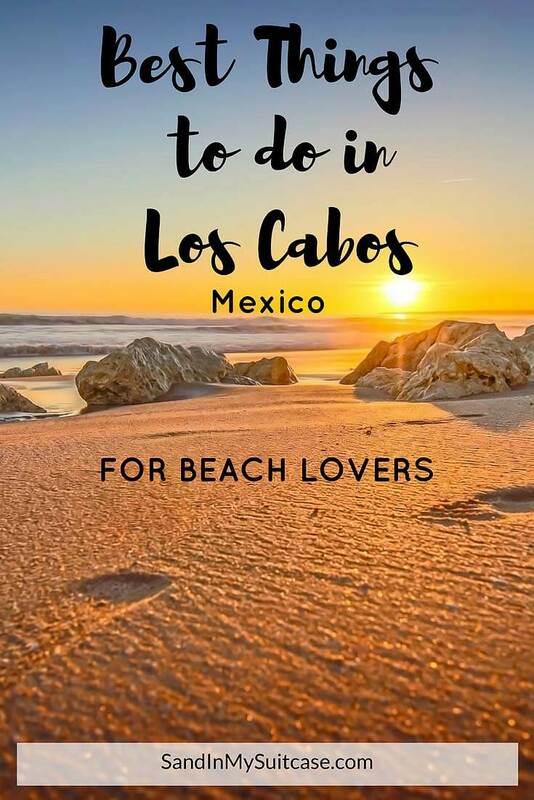 You made it to the end of our post on the best things to do in Cabo San Lucas (and Los Cabos) for beach and watersports lovers! 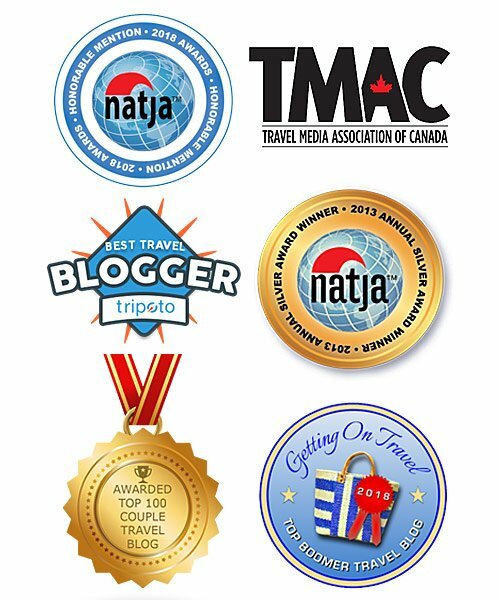 Now all you have to do is pack your bags and go… Enjoy your trip! I never really was a fan of Mexico till I went to Cabo. Loved it, the town, the people. You can just jump on a bus or boat taxi for next to nothing and just do your own adventures. Lots to do. I’d go back in a heart beat. So glad to hear you enjoyed Cabo! It’s an easy introduction to Mexico, because so many Canadians and Americans vacation there. People speak English. The hotels are high-class. Restaurants are good and safe, etc. Thanks so much for all this great info! 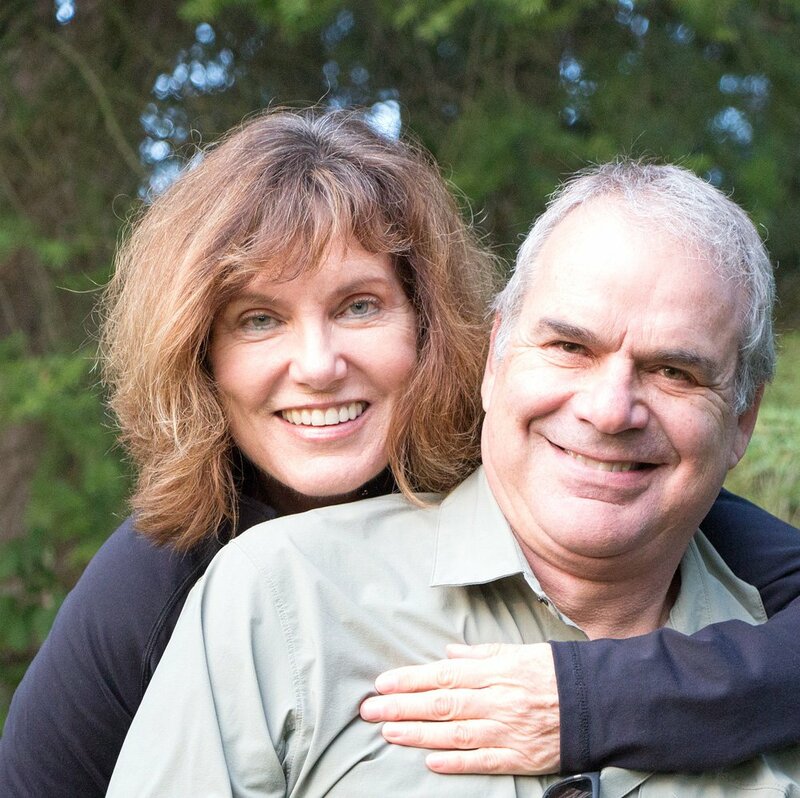 We are going to Cabo with our kids, 9,10 and 13 at the end of July. We are looking for a family friendly snorkeling tour for the day, so we will check out the ones you suggested. How is the water that time of year? Glad the info here is helpful for you :-). And the water? It should be lovely and warm for snorkeling. Have a great trip! Oh wow what a truly stunning place! I love the photos of the tropical fish! You’ll have to visit Los Cabos! 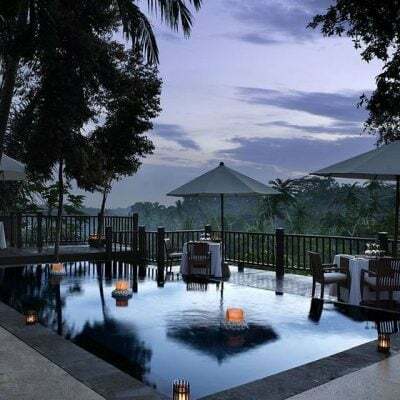 You’d love it for a winter escape :-). Great post filled with good information. I’ve bookmarked this one. Yearning for Cabo right now!